Canada’s transition to an urban, industrial wage working economy took place from 1850 to 1921. In the 1850s Canada was an overwhelmingly rural place dependent on the harvest and export of resources, mostly fish and lumber, but increasingly agricultural as Canada became one of the world’s leading dairy and wheat exporters by 1900. Over time new minerals like silver and nickel and energy resources like coal and hydro were also exported, reorienting the export economy from Europe to the United States. To support this resource based economy a new rail transportation system and urban industrial infrastructure was developed based on wage labour, not the petty capitalism of small farmers – though the new urban Canada did not become a majority of the population until 1921 nor politically dominant until after 1945. Members of the new working class built trade union organization and fought for elementary legal protections. Craft unions of skilled workers developed in the 1850s and 1860s, which culminated in Canada’s first general strike, Toronto’s fight for the nine hour day in 1872, and legalization of unions. In the 1880s Canadian semi and unskilled workers participated in building North America’s first broad union movement, the Knights of Labour. Possibly 15% of the workforce were members. When Canada entered the Wheat Boom, a period of growth above that of the United States between 1897 and the 1920s, the craft union movement was reorganized as members of the American Federation of Labor, and new forms of industrial unionism were experimented with by coal miners and railway shop workers. Though the federal government began a system of national industrial relations, it was voluntary not compulsory. This made for an explosive environment. The new wage labour market was convulsed by a series of strikes for union recognition and the security of a collective agreement for jobs, wages, and working conditions. Bitter, lengthy confrontations occurred in communities from Pictou, Nova Scotia to Nanaimo, Vancouver Island. In Nanaimo, coal miners were locked up in a concentration camp by the militia. It was in this new environment of intense class struggle that the Canadian revolutionary left was born – in theory and organizational practice. As Freiderich Engels once said, there can be no revolutionary practice without revolutionary theory as a guide to practice. But, in Canada, the theory of socialism was a mix of Christian moralism, radical sociology and Marxist economics, an Anglo-American radical tradition best described as left Spencerism. One of the paradoxes of first generation socialism in Canada is that the first leftists drew as much, if not more, upon a radical reading of Herbert Spencer’s theory of social evolution - in which socialism was defined as the natural science of social transformation - as they did from Marx. As Ian McKay points out in his book The People’s Enlightenment, Canada’s two leading socialist papers, Cotton’s Weekly and the Western Clarion were full of long articles on the correspondence between natural and social science, with society inevitably passing over to a higher form of socialist evolution. One of the great statements of Spencerian leftism, in the name of Marxism, was William Pritchard’s (editor of the Clarion) defense at his Winnipeg General Strike trial. This went on for 226 pages about the inevitability of a more ‘scientific’ union movement - like the One Big Union, the 1920s syndicalist experiment growing out of the pre-war International Workers of the World - and a new socialist state. For these ideas, Pritchard was convicted and sentenced to two years in Manitoba’s Stony Mountain federal penitentiary. As a theory to guide practice, left Spencerism was tested in a variety of ways that revealed fundamental tendencies to either abstentionism or to an abstract inability to connect ideas to activity, to link propaganda and agitation. Should socialists support unions? Among early Marxist leaders, unions were nothing more than a labour brokerage business run by ‘labour fakirs’. Russell, jailed for his presence during the Winnipeg Strike, described himself as an ‘observer’, not as a party leader conducting an intervention. Socialist Party of Canada (SPC) members who did engage in radical union activity tried to build the One Big Union with contracts that were not employer-site specific. Such sterile theory had negative organizational consequences. The Maritime SPC organization collapsed after a two year propaganda intervention in the Pictou coal miners’ strike. What about oppression? Left Spencerism didn’t have any theory for these questions, other than to assert basic equality. Instead, if pressed, leftists would revert to capitalist gender, nationalist and racialist ideas. Fortunately, the practical need to do something about votes for women, Indian treaty rights, or to organize solidarity with Vancouver Sikh migrants on the Komagatu Maru in 1914, overrode the absence of theory. While many socialists reacted against this sterile tradition by organizing independently, it would take the Russian Revolution to introduce a more thorough Marxist frame of reference of understanding. Between harsh conditions and the left Spencer radical tradition, workers and social activists built a socialist practice. This organizational response went through two phases: ‘Mixed Pickles’ and a European-style Social Democracy. ‘Mixed Pickles’ was the phrase used by Eugene Debs, leader of the Socialist Party of America (SPA) to describe the heterogeneous origins of socialism in North America – and Canada had plenty of mixed pickles. The original Canadian left tradition was made up of two class currents: middle class social activists, with a mix of Spencerist leftism, small propertied utopianism, and the Social Gospel; and working class impossibilists. The impossibilists, the first generation of working class leftists drew intransigent conclusions from their experience of the workings of the capitalist labour market. The original editor of the Western Clarion, Eugene Kingsley, lost both legs in an industrial accident. 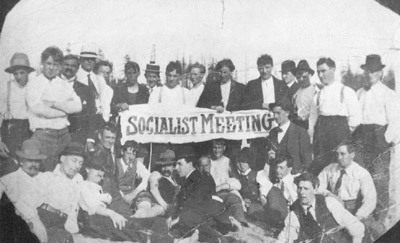 Organizationally, the first phase of leftism expressed itself in two ways, by the creation of the middle class Canadian Socialist League (CSL) in Toronto in 1899 and by the spread of the American Socialist Labour Party (a section of which split to found the SPA), which got its greatest hearing in Vancouver. Within a few years the CSL (now the Ontario Socialist Party) moved towards a working class orientation though its contacts with the SPA. The Vancouver SLP split to form the Socialist Party of British Columbia which successfully elected two provincial members of parliament and, with an independent labour MLA, secured the most progressive mining safety laws in North America. In 1904 these two organizations came together to form the Socialist Party of Canada with a membership of 2500. But the SPC leadership, an unelected and unaccountable group in Vancouver, continued to preach impossibilism, which counter posed education to practical activity, and refused to join the Second International. Paradoxically, SPC activists were among the most active propagandists for socialism and the most hostile to relating to actual workers and the oppressed in struggle. Members were even expelled for participating in single issue campaigns if this obscured the only message of ‘abolish wage slavery’. The Russian Revolution of 1905 broke the log jam. The failure of the 1905 Revolution led to thousands of Marxist politicized Finns, Jews, and Ukrainians to immigrate to Canada. They formed their own ethnic political organizations which combined more thorough Marxist ideas and practical activities. Beginning in 1907 they, with some English Canadian supporters, began to break with the SPC’s sectarianism. In 1911 the Finns in Port Arthur (today’s Thunder Bay) sponsored the creation of the Social Democratic Party of Canada (SDPC). The SDPC, with a membership of 5400 and a paper The Canadian Forward, embarked on a new practice with more grounded Marxist ideas (with an electoral platform emphasizing labour rights and a more democratic state). However, they did so on the margins of Canadian society as new immigrants, not fluent in English, and at the start of two crises – the unemployment crisis of 1913 and then the repressive conditions of World War One. In fact, 8000 Ukrainians were interned in 1914 as ‘enemy aliens’. All the same, the SDPC played a valuable agitational role in leading mass demonstrations of the unemployed for municipal relief and then, uncompromisingly, to oppose the war, especially the draft for military service in 1917-18. Issac Bainbridge, the Forward’s editor was repeatedly arrested until the paper and all ‘subversive’ foreign language papers and groups were banned in 1918. At least 130 socialists were jailed and some 2000 immigrants were deported by 1920. Despite these repressive conditions, when World War One ended there was an explosion of political protest, the farm-labour revolt (capturing three provincial governments and electing the second largest group in the national parliament), and labour action for union and collective agreement recognition. In 1919 over 20% of wage workers joined unions and the strike level, most graphically illustrated in the Winnipeg General Strike, was not reached again until the 1970s. Probably the single biggest demonstration of this whole period occurred during the General Strike when 10,000 plus workers gathered to listen to the outdoor ‘teach ins’ of the Labour Church. While 1919 was not a revolutionary crisis, it was a mass moment for radical reform where socialists who could connect had an opportunity to party build on a large scale. In this polarized environment, the first Canadian left met a decisive test, with which it struggled. The SPC proved to be unredeemable. No matter how furious its propaganda activity and how brave individual militants were, it could not relate. Workers admired Pritchard’s stand against the Canadian state’s judicial persecution but couldn’t see the relevance of Spencerist leftism. Nor could the party relate to the detailed long term work of new and old union building. In 1925 the SPC formally disbanded. The SDPC, despite its theoretical and practical reorientation, was bypassed by events. Not necessarily for its own reasons. In part, the party was disorganized by repression. In part, the foreign language membership was not in a strong position to relate to most Canadian workers who spoke not only English, but in the political reform language of the social gospel and British rights. Given these conditions, the party did not have time to build moral authority for Marxist ideas and practice with the militant minority through joint work. But what the SDPC did gain was experience in the struggle against war and heightened class struggle. And this experience generated a leadership cadre, such as Maurice Spector, SDPC youth leader, who would help found the Communist Party of Canada in 1921. The first generation of Canadian revolutionary socialists, despite all these handicaps, built a vibrant socialist culture through its propaganda work and modest agitational initiatives. It was the first group of Canadian leftists to grapple with the complex issues of the new urban, industrial Canada. How can a broader union movement be built? What about gender and racial oppression? Issac Bainbridge even began to think past British imperial nationalism about unity with French Canadian workers – who had a tradition of militant reform around Montreal’s annual May Day fight for free speech. And how could socialists translate these ideas and questions into relevant activity, to move from propaganda to agitation? World War One and the October Revolution was the great dividing line in creating a new frame of reference by which ideas and practice could better inform the struggle to build a revolutionary socialist current. To act on this possibility, a new party had to be built, the Communist Party of Canada.